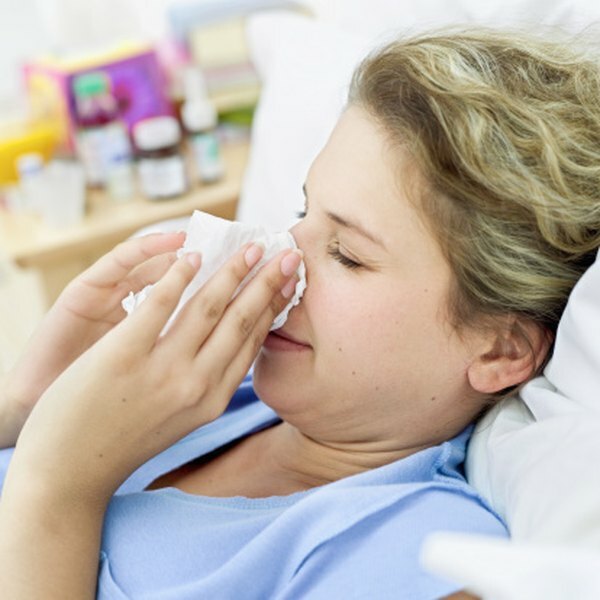 While all children get the sniffles from time to time, it can be difficult to determine if the cause of that runny nose is a mere cold or an allergy. One indication that your child could have an allergy is the formation a white line across the bridge of the nose. This line often is a result of your child repeatedly rubbing her nose in an effort to relieve some of the discomfort that comes with allergies in a motion that is referred to as an allergic salute. What Causes an Allergic Salute? Children with a runny or itchy nose may repeatedly wipe with an upward motion of their palm. This motion is called an allergic salute. Over time, pushing up on the end of the nose creates a horizontal white line on the skin across the bridge of the nose. The medical term for this white line is a transverse nasal crease. Allergy sufferers can have various other symptoms apart from a stuffy, runny or itchy nose that lead to the allergic salute and resulting white line. They might also have itchy, runny, red eyes or a cough. They might also have dark circles under the eyes called allergic shiners. This is not caused by lack of sleep, but congestion of blood in the small veins seen through the thin skin below the eyes. Typically, if the child stops rubbing his or her nose vigorously with the upward motion that makes the allergic salute, the appearance of the white line should get better over time. However, the longer the crease has been there, the deeper it might be and the longer it might take to go away. The frequency of the child’s allergy symptoms might also play a role in whether or not the white line disappears. A child who has year-round allergies as opposed to seasonal allergies will be doing a lot more nose rubbing. In rare cases, children might inherit a crease across their nose through a gene passed down in their family. This is called a familial transverse nasal groove, and unlike the transverse nasal crease that is caused by pushing up on the nose in an allergic salute, this groove remains visible even when downward pressure is exerted on the tip of the nose. As with other health issues, consult a doctor if you have any doubts or concerns, or if the child has symptoms that could be caused by an allergy. Getting symptom control for an itchy or runny nose could help keep your child from rubbing his or her nose and creating a crease across the bridge. It is also important to identify the cause of the allergy so that children can avoid triggers that worsen allergy symptoms.